After a long discussion, we chose the subject presented. This topic is related to our everyday life and it is much demanded (especially in the Chinese market). 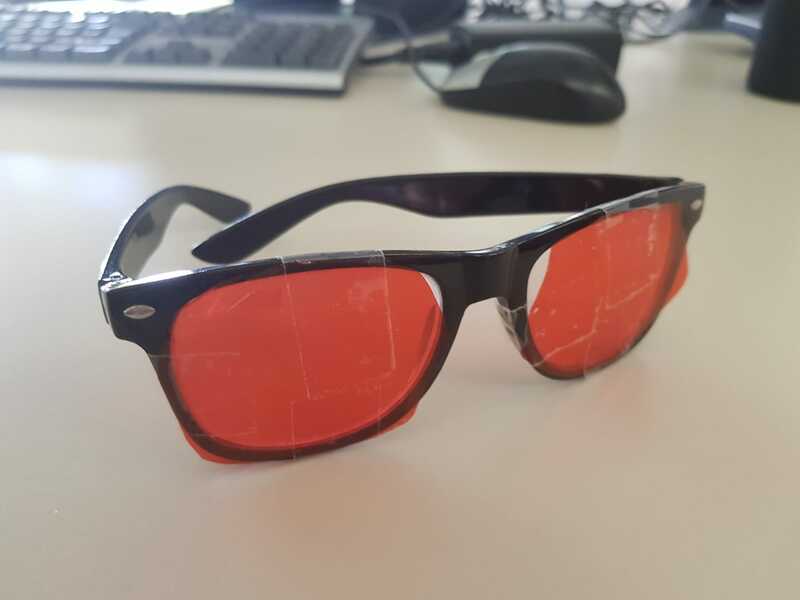 Moreover, this project is created to give a solution to a well-known problem among people who wear glasses: changing glasses from everyday-use glasses into sunglasses when going outside to the sun. Now, our innovative idea is based on this principle and we would like to create friendly-to-eyes glasses those are turning to reddish shade so it is good for the usage with screens. We thought about a solution to the problem presented in a chemical way. As you see in everyday life, many of the people around you wear glasses. Have you ever minded of a world in which people would wear just one pair of glasses for any light condition? Both sunlight outside and screen light indoors? Now, it is your turn to invent such a device! The teacher will divide you into a small group of 4-5 students each. Each group should search and write in the literature for the need for such a device. Discuss the problem described with your peers and think of a solution. Document the plan of the work. Be prepared to present your product to the classmates in two weeks (15 minutes of the presentation). Skills: Communication with your peers and teachers, technology skills and both creative and critical thinking. The need for such a device (25 points). Nowadays, many people, especially people with nearsightedness wear glasses. Take China for example. There are more than 450 million people suffering nearsightedness and over 90 percent of university students are suffering from it. So glasses are very important in life. But the glasses in the markets cannot satisfied people's need in different situations, such as the environment of strong sunlight and when eyes get tired after sitting for a long time in front of the computer. There are some kinds of sunglasses, sun hats, and color-changed glasses. But some of them are ugly, and some of them can only protect eyes in only one situation. Therefore, we designed a kind of glasses that can deal with different situations and protect eyes. Present your device (a model of the device) (25 points). Our new glasses combine two types of glasses on market: normal glasses and sunglasses. We also add a new function of protecting users’ eyes before screens. Generally, the glasses have three modes automatically. When you go out, the glasses can go from totally transparent to dark color according to the light strength. When you are before screens (TV, computer, mobile phones etc. ), it goes to a red color which is considered better for the eyes. In other cases, it is like the normal glasses. Why is the idea you presented innovative? (25 points) The basic idea is using just one pair of glasses to protect your eyes in different situations. There are different types of glasses on market now, of which few are multi-functional. It is not convenient to change different types when you are in different environments. What’s more, few people wear eye-friendly glasses even if they are exposed to screens for many hours every day. Our new product can change automatically in a normal environment, under sunlight, and before the screens. Why is the idea you presented better than other ideas? (25 points) There are some other innovative ideas like using some mechanical methods, which means to attach some extra glasses on the spectacles frame using a microcomputer to control them up and down according to the sunlight or the screen light. However, it is too complicated to design such a structure in such a small space. We concentrated on the materials that can change color accordingly. So this product will save a lot of space and look beautiful. As mentioned, our product is made in order to give a solution for every light condition to people who wear glasses in their everyday lives. While the person is indoors, the glass would be "normal", without any color. When the glasses will expose to a light, they will change the color of the glass according to the use needed (blackish shade in the sun and reddish shade when exposed to a screen). An exposion to UV light causes a change in the structure (the "ring opens"), and then the absorption is possible, that causes the change in color. Why is the reddish shade of glassed better for health? The blue light is a short-wavelength visible light associated with more eye strain than the longer wavelength (such as red and orange). By reducing the color temperature of the display, we low the amount of blue light emitted by a color display for better long-term viewing comfort. This color let us look at a screen at the screen and feel less tired during the work. it also has the wide scientific background, the main problem I found with the idea is that its already existent in the same way they suggested. The introduction of your production is really impressive in the video. You guy make an interesting and detailed description. However, It's pity that photochromic lenses are already on the market. Photochromic lenses are optical lenses that darken on exposure to specific types of light of sufficient intensity, most commonly ultraviolet radiation. In the absence of activating the light, the lenses return to their clear state. Photochromic lenses may be made of glass, polycarbonate, or another plastic. They are principally used in eyeglasses that are dark in bright sunlight but clear in low ambient light conditions. They darken significantly within about a minute of exposure to bright light and take somewhat longer to clear. A range of clear and dark transmittances are available. I think your group should do market research before the assignment. it's a nice project but i think it's not a apporiate projectr to promote students' innovative thinking. Because there are maturel technologies and products to solve the problem. In my opinion, the project of pbl should be based on the real desires of our daily life which are not fulfilled by maturel methods. This comment is from LI ZIXUAN for group 2. The multi-functional sunglasses are really fantastic which impress me a lot. The device is both practical and convenient and all the more so when someone is extremely careless. It would be easier for them to bring mere one pair of glasses which can function as normal glasses as well as sunglasses which can protect their eyes from the sunlight. I think this is a goog project which can encourage students' innovative ability through learning basic knowledge and real practice. But maybe the quality of the sensor which will be used is a problem, because it has to be sensitive enough to change based the complicated environment.